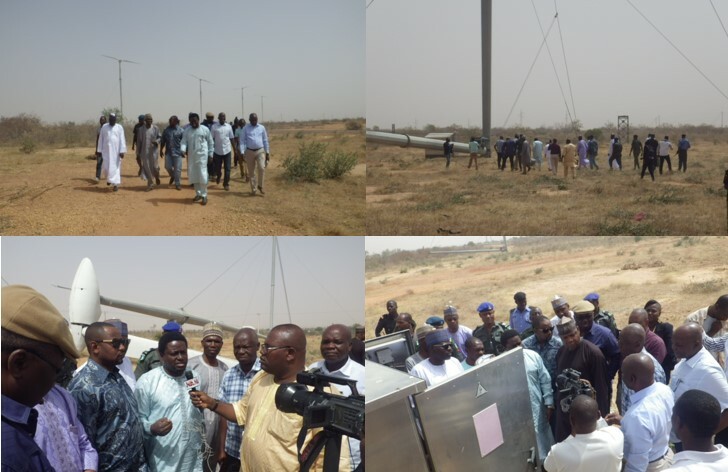 February 24th, the Power Committee of the Nigerian national assembly visited the VERGNET wind power plant of Katsina. Mr Babatunde Raji Fashola who is the Federal Minister of Power, Works and Housing required Vergnet to organize the visit of the committee as they are currently preparing 2017 budget and the Katsina wind farm project is part of it. The Department is responsible for the development and supervision of some of the major publicly funded power plant projects. That visit had a major media impact . The delegation, about 20 people, was impressed by the size of the turbines but also by the number of journalists on site. In line with the Government policy of promoting renewable energy, a wind map for the entire country has been developed, indicating numerous viable sites for the deployment of wind turbines for power generation. VERGNET is responsible for the construction of the 10-MW Katsina wind farm which represents 37 GEV MP C 275 kW mounted at a height of 55m on a tiltable tower in the northern region of Nigeria. It is the first wind farm in Nigeria. The project is carried out by VERGNET and the FEDERAL MINISTRY OF POWER (FMP). VERGNET has been selected for the robustness of its turbines and their easy installation and maintenance that requires lighter logistics than traditional wind turbines. The project has fully is nearly achieved and will be commissioned shortly. The installation of wind turbines was carried out by VERGNET who trained Nigerian technicians in France for end of erection and maintenance. This cooperation will lead to the construction of wind farms in other states of Nigeria. For many years, one of VERGNET’s major value is to bring a local solution to a local consumption. Find out more about our wind energy solutions, solar applications, and hybrid energy solutions or read our case studies to learn about our renewable solutions in action throughout the world.